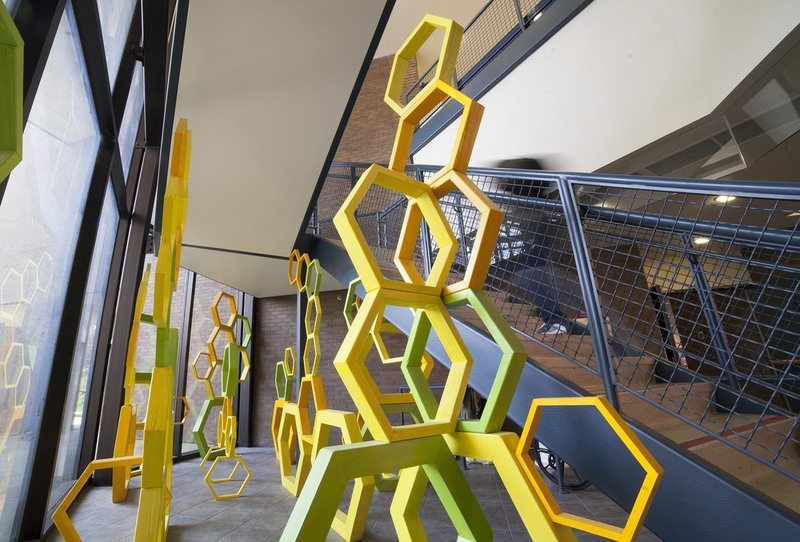 A site specific installation in the atrium of the Chemistry Building on the campus of Stony Brook University. The installation is in celebration of Prof. Paul Lauterbur, who was awarded the 2003 Nobel Prize in Medicine, and who founded the MRI in the Chemistry Building of the University. Chemistry, as a broad topic lead my mind to the molecular shape of hexagons. They are made from three different sizes of wood: 1x2, 2x4 and 4x4. The purpose was to give it dimension and depth. The color scheme of yellow, orange and green pertain to the colors I associated with chemistry, and also give the structure a popping out effect, beneficial when looking inside from the outside, through the mirrored windows.